Smaller, hairier and grayer than T. biforme, violet on edge. White rotter on conifers. 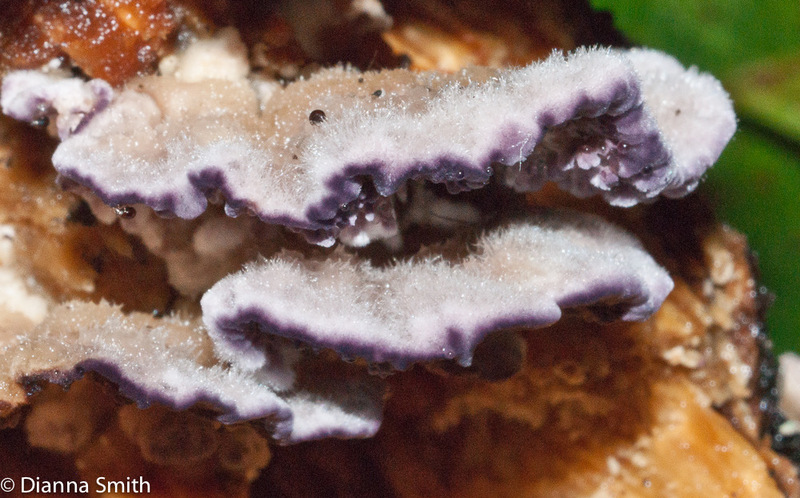 “Violet-toothed Polypore” Looks very similar to Trichaptum biforme, but is slightly smaller. The top of this annual fruiting body is a grayish-white, sometimes zoned hairy polypore cap. Often the caps are dressed in algae growth. Beneath some of the pores expand and break into spines. Thin outer edge of the hymenium is purple. Inner section is cream becoming brownish-yellow. It fruits on dead conifers.